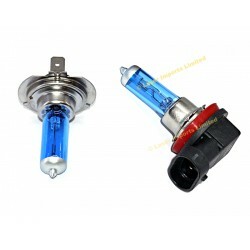 Halogen Xenon HID look headlights to fit most makes and models of cars to give that ice white look. You are buying 2x 9005 ice white bulbs. (2 bulbs)These are a direct upgrade replacement for your..
You are buying 2x 9006 ice white bulbs. (2 bulbs)These are a direct upgrade replacement for your..
You are buying 2x H1 ice white bulbs. (2 bulbs)These are a direct upgrade replacement for your s..
You are buying 2x H3 ice white bulbs. (2 bulbs)These are a direct upgrade replacement for your s..
You are buying 2x H4 white bulbs. (2 bulbs)Note these are the standard bulbs, not ice white like..
You are buying 2x H7 ice white bulbs. (2 bulbs)These are a direct upgrade replacement for your s..